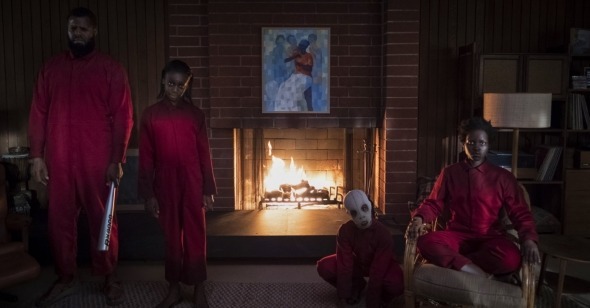 It’s clear after the epochal event of Get Out two springs ago and the release of his portentously, grandly named Us, that Jordan Peele aims to hit multiplex viewers on a primal level, using horror suspense to tease out the deeply entrenched fears and anxieties that fuel our daily lives. A sharp iron poker to the forehead is one thing, but a finely tooled use of symbolism will always get them where they live. With the Sunken Place, Get Out added to the cultural lexicon a metaphor about American racial identity so vivid that it could at least trick white viewers into thinking they got it (no small feat). In Us, Peele unleashes a bevy of conceptual ideas about race, class, and American-ness that are only difficult to grasp if the viewer is not really looking. Us is supremely confident filmmaking, a thrill ride shot through with existential urgency. It can be enthralling to witness an emboldened, talented filmmaker tearing through a follow-up to a box-office breakthrough. The first half of Us especially has an unerring compositional assuredness, reminiscent of Shyamalan’s shot-for-shot swinging for the fences with Unbreakable after The Sixth Sense. Beginning with a flashback sequence set in 1986, the film introduces us to prepubescent Adelaide (newcomer Madison Curry), first seen, as she often will be, from the back of the head. She’s soaking in a television promo spot for the fundraising initiative/promotional campaign Hands Across America. The well-intentioned event did raise millions of dollars intended to fight poverty and homelessness, but its Kumbaya-ish publicity stunt, which saw more than five million Americans holding hands from sea to shining sea in the impossible hopes of creating an entire human chain, still fell short of its cash goals. The significance of this only makes itself clear—or, tantalizingly, doesn’t—as the film continues, but Peele is so good at imbuing everything onscreen with totemic significance that our eyes are already perceiving each scene as a potential clue. After this brief introduction, Peele and It Follows cinematographer Mike Gioulakis’s camera trails young Adelaide, clutching a blood-red candy apple that seems almost as big as her head, as she wanders a boardwalk carnival in Santa Cruz. Breaking away from her parents, the girl winds up peering at the facade of an ominous funhouse, sporting the sign “Find Yourself.” Inside, feeling her way through a fairy-tale forest decorated with mirrors and mechanical owls, Adelaide comes across a figure that has her exact shape, size, and hairdo, yet it’s turned around, its face hidden from both her and us. Peele smash-cuts to a close-up of a white rabbit, signaling that little lost Adelaide may have wandered into a different kind of wonderland. Accompanied by Michael Abels’s satanic, Omen-like music, a gradual zoom-out indicates the furry animal is one of many, seemingly part of some lab experiment; it’s doubly apt that both of Peele’s films thus far have endeavored to test the limits of formulas, since they each hinge on science experiments gone not just awry but evil. The little girl wakes up in a car passenger seat in 2019. She’s now embodied by Lupita Nyong’o in what becomes an increasingly physical, guttural wail of a double performance. Adelaide and her bespectacled, teddy-bear husband Gabe (Winston Duke), mostly indifferent teen daughter Zora (Shahadi Wright Joseph), and distracted young son Jason (Evan Alex) are introduced as a perfectly gender-balanced American family unit, en route to their summer home. That they have a summer home at all signals the Wilsons’ comfortable, middle-class status, though their lives are hardly as luxe as that of their white friends up the road, Kitty (Elisabeth Moss) and Josh Tyler (Tim Heidecker), proud parents to a pair of whiny teen twins and owners of a modern, glass-enclosed, virtual voice–assisted house. The Wilsons seem a fairly tight bunch, though even before things get weird, Adelaide is given to ponderously meditative interludes, as though she’s haunted by some unseen menace. This goes beyond any kind of simple “body snatchers” referencing. There’s enough of a primal pull to the idea of a family of four relentlessly pursued and attacked by its own shadows, but Peele keeps on upping the ante by piling on images or references that carry socio-historical weight, from an opening title card that refers to miles of “underground tunnels” beneath American soil to Red forcing Adelaide to chain herself to her own coffee table to the invaders’ red jumpsuits, which look unavoidably like prison garb. Peele’s metaphor is strong enough to stand on its own as “universal,” but the film very clearly carries particular resonance as a multiplex thriller by a black filmmaker and starring black actors in the main roles. For Film Comment, Ina Diane Archer invokes W.E.B. DuBois’s double consciousness in mulling the film—and its twinned performances—an apt, revealing reading. It’s surely not just a visual joke (though it’s a very good one) that after the Wilsons have desperately and scrappily fought off their marauders, the white Tylers, who probably never had to look over their shoulders once in their lives, are dispatched by their own doubles in one quick, blood-spraying stroke—filmed in a single cruel, static shot, through the windows from outside the house. Peele may ultimately rely too heavily on a series of expository scenes to tie up loose narrative threads around the circumstances of the “untethering,” but Us has already been so expertly closing a circle around the viewer, and Nyong’o has so fully committed to translating his high-concept horror into snarling flesh and blood, that the film never slackens. By the same token, if a preponderance of last-minute cross-cutting flourishes slightly dulls Peele’s final plot twist of the knife, it’s the coda, set to Minnie Riperton’s terrifyingly upbeat “Les Fleurs,” that lingers in the mind (“Inside every man lives the seed of a flower/If he looks within he finds beauty and power.”) As it had been imprinted on little Adelaide’s impressionable mind, Peele shows us mountain ranges of people joining hands across America, connected like paper dolls in a winking travesty of Reagan-era social activism. Altruistic endeavor made sinister—it’s another of the film’s many mirror images that might tell a more persuasive truth than the original.